Do you need local customers? Do you have a physical address and want people to go there? If your head nods towards yes for these questions, then your website needs local SEO service. About 70% of online users use a location-based search when looking for products and services while 90% look up the location of a business on Google maps. That means if you don’t appear in local searches online, then you’re missing out on a huge amount of leads and ultimately sales. So, it’s extremely important for you to be visible online. Outshine Solutions is a leading online marketing company with outstanding results for getting you more search engine rankings, traffic, leads, and sales. Why You Need a Local SEO Expert? Many people are searching online for a product or service and many of them are ready to buy. But, if they see your competitors first, then “Who will get the sale? Of course, not you. Therefore, getting those buyers through the front door of your home starts with making you noticeable on the web. We, At Outshine Solutions, accomplish that through creating a local reputation online, establishing high-quality backlinks, citation building, etc. Local SEO can create a huge difference in the success of your online business with the local presence in various areas and regions. Every location is different and every area has its own marketing needs to get consumers to the location. Our Local SEO services can help you reach a location-based target audience. Our Local SEO services include Wikipedia Creation, Google My Business Set-up, Geo-Targeting, Bing Long Listing Creation and more. People will benefit from these services include small businesses local grocery stores, vis-à-vis eateries, libraries, local franchisees, museums and professionals like plumbers, makeup artists, educators, electricians, etc. Reliable Online Presence: We optimize your business site appropriately to make it appear naturally on the search engine result pages (SERP’s). Happy Customers: We have a long and growing list of happy customers who have found and enjoy success with our unmatchable services. Improved Sales: Our Local SEO services will generate increased visibility which in turn converts the leads into sales. Healthy ROI: We ensure the best return on investment. Our local web marketing team is expert in local SEO and bring huge returns on your marketing investments. With our affordable Local SEO packages, you will be at the top and we will create a presence on all the local listings, including Google My Business. We’ll make sure you are front and center if anyone is searching for what you offer. We have effectively designed our Local SEO Packages to improve local search rankings and boost traffic and sales. Some of the common Features of Local SEO Plan include Citations in other sites/directories, H card integration and Page updating for local search. Our Local SEO packages comprise of detailed weekly, bimonthly and monthly reports. 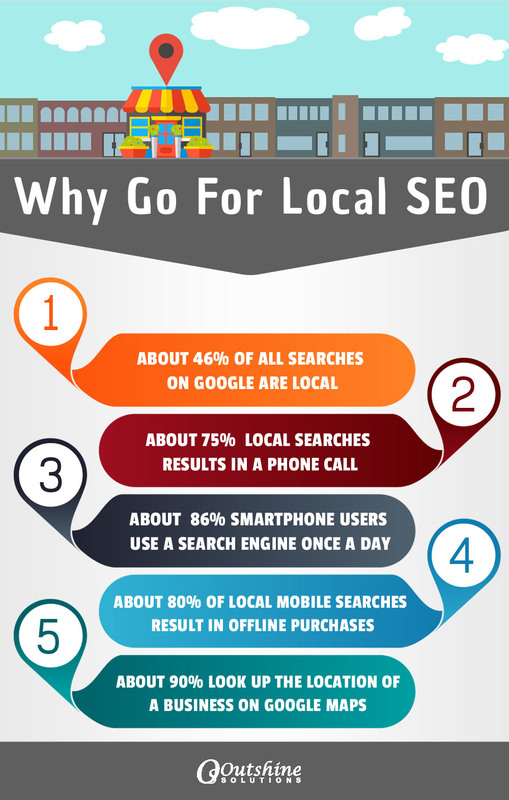 You can check out our Local SEO plans that are customized according to your needs here. Your customers are looking for your business, so let Outshine Solutions help them find you.